I have decided that Ravelry.com is a total addiction that I can not help but love. I have signed up for my first round of swaps through this site and I have to say I am very excited. The first is for a group based on Creepy Cute Crochet by Christen Haden one of the books that was my major inspiration in making all the movie characters that I have made in yarn. This one is the one that I am most excited about because not only do I get to play with patterns that I haven’t made out of her book but I get the option to free style a bit which I have some cute plans for. This swap however has not real theme other than Autumn. My partner for the swap is a Halloween fan as well so I have some plans for that. The only downside to the swaps as far as you all are concerned is that I have nothing to share till they are delivered as they are secret till the person that gets them has the initial surprise, and we would hate to ruin the surprise wouldn’t we. So to keep up with the demands of our September experiment and all the swap patterns I will be crocheting and knitting as fast as I can. And on that note I have terrible pictures of my first offering for the September experiment. 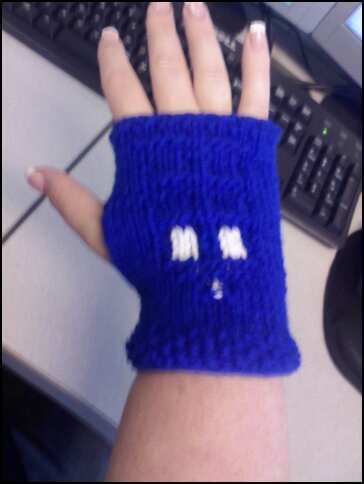 These are knitted fingerless gloves with a seed stitch edging top and bottom and an inlayed and raised TARDIS that faces the fingers. I promise to update the gallery with better pictures when I have a light box again. But for now here is what I have I hope you like it. This entry was posted in Experiment, fandom, Swaps. Bookmark the permalink.